Monferno in game: 287 Who? Important notice! Pokemon Monferno is a fictional character of humans. Monferno (Japanese: ????? Moukazaru) is a dual-type Fire/Fighting Pokémon introduced in Generation IV. The flame on Monferno's tail has several purposes. It can be controlled to keep opponents at an ideal distance or stretched in order to make Monferno appear larger. 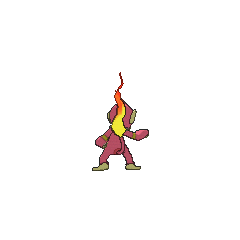 The size of its flame, in combination with brightness of its facial marking, indicates this Pokémon’s position in its pack. The bigger the flame and the brighter the pattern, this higher the Pokémon’s position. 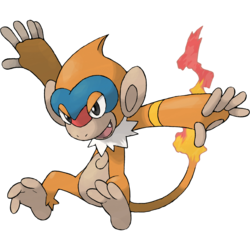 In addition to using its flaming tail as a weapon, Monferno can also leap from ceilings or walls to perform aerial attacks. In Evolving Strategies!, Ash's Chimchar evolved into Monferno during his battle with Paul. 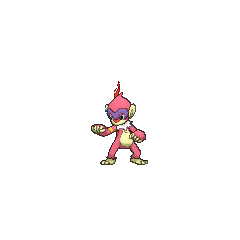 It later evolves into Infernape in Fighting Ire with Fire!. Ash's Monferno also made an appearance in the beginning of Arceus and the Jewel of Life. Ash's Monferno also made an appearance in this movie when Ash and his friends met Damos for the first time. Flint's Infernape was seen as a Monferno in Four Roads Diverged in a Pokémon Port!. Monferno made its debut appearance in Camping It Up! where it was one of the Pokémon belonging to the Pokémon Summer Academy. It was trained by Angie. 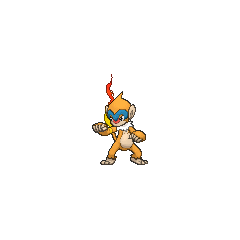 Pearl owns a Monferno after his Chimchar evolved, which then evolved again alongside Tru into an Infernape from accumulating experience. 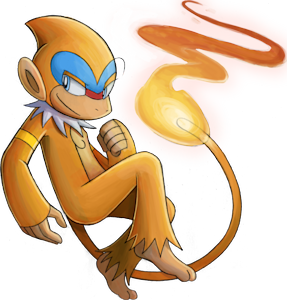 Yu Shirogane's Monferno evolved from a Chimchar and then into an Infernape due to the training he went through. Moukazaru is a combination of ?? moka (roaring flames) and ? saru (monkey). Mandarin Chinese ??? Menghuohóu Literally "Fierce fire monkey"